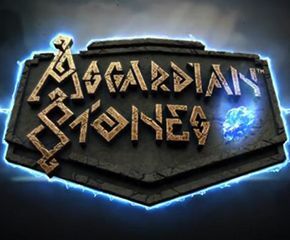 Asgardian Stones is a thrilling online slot from Net Entertainment. 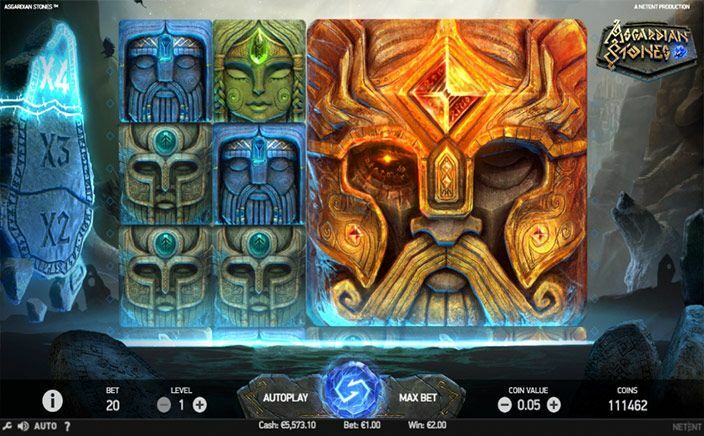 Based on the Norse mythology, this visually stunning slot will make you feel the massive power and the magic of the ancient times as the colossal stones guard gates of Asgard. The slot is available on all the devices and can be played with the min and max bet of 20p and £200 respectively. The RTP is 96.31%. The slot comprises five reels, three rows and twenty fixed paylines. Just like the Gonzo’s Quest, Asgardian Stones is played with the symbols falling into the position instead of utilizing spinning reels. The symbols in winning combos explode and are substituted by the set of the new symbols. Wins will be paid out if three or more icons of the similar kind, in the consecutive columns beginning from the left, lands on the payline. Asgardian Stones includes nine symbols and five of them are the premium symbols which have been made out of the stone faces of different colours whereas, Q, K, and A are lower values. Also, there is a wild symbol which can replace all symbols, except a Bonus Wheel. All the icons will randomly occur as the Colossal version, within a main game and bonus. The wild icon, however, will only occur as the Colossal in bonus. The Colossal symbols are formed out of the 3×3 or 2×2 blocks and they may or may not be shown in full, depending upon how they will land on reels. Those are basically the colossal symbols which have the power to crush symbols beneath them. For each row, crushed, a multiplier will be added going from the x2 to x4. And, this has the potential to result in few decent wins in the main game round. A Bonus Wheel is the symbol block of the 3×3 symbols which can land on last three reels only, within the main game as well as the bonus. It can land partially or fully visible in a play area that means only a few of the eight sections on the wheel can be visible. Bonus Wheel- there are three sections with five free spins and rest of sections are made up of the coin wins. Those sections which are landing in active fields are the prizes. A great thing with bonus is that a Wild symbol occurs as the colossal symbol. If the colossal wild is a part of the win, it will then be split up into the 1×1 wild icons. This bonus wheel can get reactivated maximum of three times in free spins and can activate maximum of twenty-five extra spins in total. Asgardian Stones is a superb slot with an astounding soundtrack. It has a brilliant gameplay that features clever bonus features. It is medium variance slot which allows the players to attain huge wins.